To provide single, low-income adult men and women with safe affordable permanent housing and temporary accommodations for single men and women who require emergency shelter and who are able to live independently. The residence at 1101 McDougall, which opened December 1, 1989, was built as a result of need for permanent housing for low-income men and women in our community. The McDougall site was officially opened on December 1, 1989. Built by Roko Construction Ltd., the architect was Joe Passa. The six-floor apartment building was constructed with 70 bachelor suites and 5 two-bedroom suites for permanent housing, 6 of which are dedicated as accessible units, with tenants who are provided with 24 hour care from the Association for Persons With Physical Disabilities. This agency also called A.P.P.D, has an on-site office, which is staffed 24 hours per day making independent living possible. There are also 5 additional bachelor units, which are used for people in the community who are in need of clean and safe “emergency” bachelor suites for a total of 80 units. The Dougall street residence located at 455 Dougall was also built as a result of the need for permanent housing for low-income single men and women in our community. It was opened on May, 1st, 1995, built by Marathon Construction Ltd. And the architect was John Hreno. The Dougall residence also has six floors with fifty-six one bedroom apartments, five of which are dedicated as accessible units, with tenants who are provided with 24 hour care from A.P.P.D, who use one additional unit as an office which is staffed 24 hours per day. Both McDougall and Dougall residences are classed as adult buildings and occupancy is denied to persons less than 16 yrs of age. 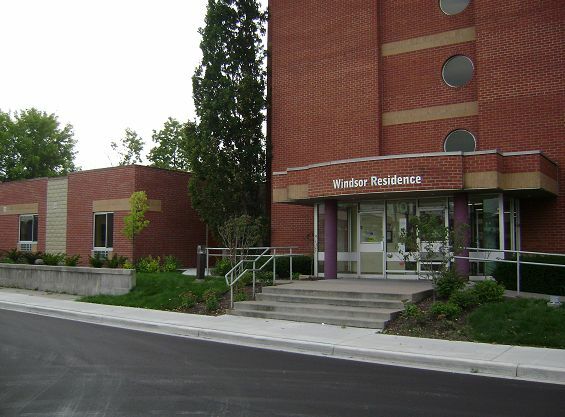 Both buildings presently receive funding from the City of Windsor, under a new department of social housing. Our emergency shelter component, consisting of three completely renovated and accessible furnished bachelor suites is presently utilized to capacity, with referrals on a daily basis from social service agencies, hospitals and self- referrals. These units are available on temporary basis only and are operated under “The Innkeepers Act”. We maintain a strict “zero tolerance policy” for behaviour, which is applicable for all temporary guests, and a code of conduct and rules of behaviour must be signed prior to registration. Maximum stay for clients using temporary units is sixty days. We operate two transitional bachelor suites completely furnished and renovated for accessibility. These suites are available for youth ages 16 to 24 years of age and the maximum stay is up to nine months. Full supports by staff include life skills, and several different programs to get youth ready to live independently. This site was officially opened on November 1, 2010 as an affordable housing project under the federal and provincial government stimulus funding for housing. Fifteen special needs bachelor units on one floor were built in partnership with New Beginnings, Community Living, The Inn, APPD and the Act team. All units in all of our buildings are rent geared to income; qualifying residents are processed through the central housing registry. Alliance General Contracting built Windsor Residence II, and the architect was Architectura.